Infants and children are prone to AOM because their short, broad, horizontal Eustachian tubes allow pathogens to spread easily from the nasopharynx to the middle ear. This permits fluid from the upper respiratory tract to travel to the middle ear, causing inflammation. The fluid accumulates microorganisms that foster infection, causing a virus or bacteria to spread. AOM incidence starts between ages 0 and 12 months and peaks at age 2. By 12 months, 62% of infants have had at least one episode; by age 3, about 85% have had at least one episode. Incidence decreases to about 2% by age 8. Many pediatric providers aren’t sure whether to prescribe antibiotics for children with presumptive AOM or to observe instead, waiting to see if the infection resolves on its own. Antibiotics are prescribed for AOM more often than for any other childhood illness, despite literature showing a positive response to watchful waiting. In fact, recent research indicates more than 80% of AOM cases resolve spontaneously without treatment. (See Reviewing the evidence.) What’s more, inappropriate antibiotic therapy contributes to unnecessary antibiotic use, increases bacterial resistance, reduces antibiotic efficacy, and ultimately contributes to the growing problem of bacterial resistance. 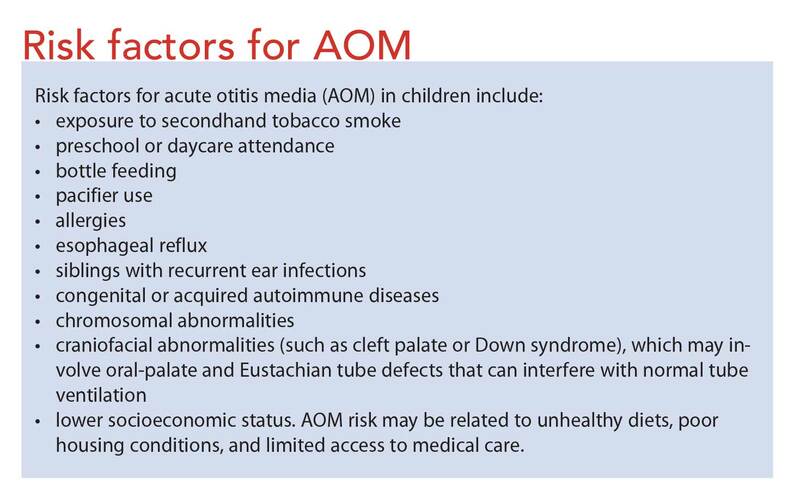 In some cases, clinicians mistakenly diagnose AOM when the child doesn’t meet the criteria, or when the child actually has otitis media with effusion, not AOM. Some have doubts about following AOM diagnosis and treatment guidelines. They may prescribe antibiotics simply because they don’t want parents to feel they’ve left the office empty-handed. AOM can be diagnosed in several ways. The quickest, most common, and least uncomfortable method is otoscopic TM examination, which provides an enlarged and illuminated view of the outer and middle ear. Guidelines recommend pneumatic otoscopy as the gold standard for providing greater diagnostic precision. With this method, a simple otoscope is adapted with an insufflator bulb; then a puff of air is released into the patient’s ear to assess TM mobility. Normally, the TM fluctuates with the puff of air, whereas a bulging TM with fluid behind it doesn’t move. This tool is 70% to 90% sensitive and specific in finding evidence of MEE—an important factor in deciding whether to treat AOM or observe the patient instead. Acoustic reflectometry measures pressure within the ear canal. The procedure is relatively inexpensive and safe and doesn’t require a seal for pressurization. Available over the counter, it provides a useful way to detect fluid behind the TM. However, it shouldn’t be the only tool used to diagnose AOM. In many cases, clinicians have difficulty distinguishing viral AOM from bacterial AOM without a culture of middle-ear fluid, which typically isn’t done in the primary care setting. As a result, clinicians may refer patients to an ear, nose, and throat (ENT) specialist for tympanocentesis to determine if the infection is viral or bacterial (especially if the child has recurrent ear infections). For this test, the patient must stay still while the clinician removes fluid from behind the TM with a needle and syringe; the fluid is sent for culturing. Tympanocentesis requires expensive special equipment and extra staff or nursing personnel. What’s more, this invasive procedure involves a needle, which can cause pain and trauma in the child. It’s usually done only in resistant AOM cases by an ENT specialist. Because the evidence indicates AOM usually resolves spontaneously, practitioners should focus on providing adequate analgesia and limiting antibiotic use. Also, before prescribing antibiotics, they must strongly suspect bacteria are prevalent in the middle ear. Current clinical practice guidelines on AOM management recommend observation and close follow-up for children ages 6 to 23 months with nonsevere unilateral AOM. (Nonsevere AOM is defined as mild ear pain with symptoms present for less than 48 hours and a body temperature below 102.2° F [39° C]). The guidelines also recommend observing children ages 24 months and older with nonsevere unilateral or bilateral AOM. 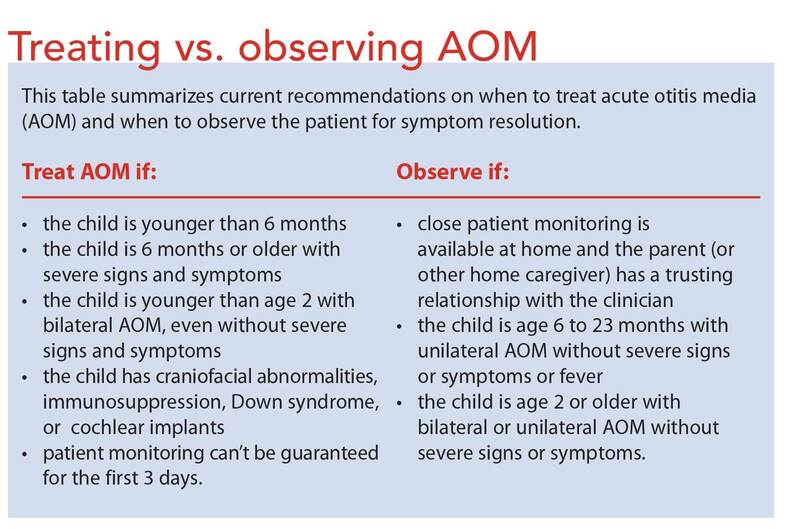 (See Treating vs. observing AOM). • have a temperature above 102.2° F (39° C). Antibiotics also are recommended if patient monitoring within the first 3 days can’t be guaranteed. If symptoms don’t improve or if they worsen within 48 to 72 hours after either antibiotic initiation or the start of observation, clinicians should consider other treatment options, after reassessing the patient in a clinical setting and excluding other differential diagnoses. They must weigh the potential benefits of therapy against potential harm. Studies show 1 in 14 children who receives antibiotics experiences an adverse effect, such as diarrhea, vomiting, or rash. Observing the child instead of prescribing antibiotics can avoid these adverse effects. When antibiotics are indicated, high-dose amoxicillin is recommended as the first-line treatment because it’s effective against the most common bacteria found in AOM, including Streptococcus pneumoniae (the most common gram-positive bacterium) and the gram-negative bacteria Haemophilus influenzae and Moraxella catarrhalis. Amoxicillin in liquid form is palatable, safe, and cheap, with a narrow microbiologic spectrum. Recommended duration of therapy is 10 days for children ages 2 and younger with moderate to severe AOM; 7 days for children ages 2 to 6; and 5 to 7 days for those ages 7 and older. Treatment of recurrences depends partly on whether AOM recurs within 30 days of the patient’s last antibiotic course, or later than that. • If AOM recurs more than 30 days after an antibiotic course, the most likely cause is a different bacterial or viral pathogen or one that’s not susceptible to that antibiotic. In the latter case, treatment should include amoxicillin-clavulanate as initial therapy, even if the patient received this antibiotic for the previous episode. If clinical improvement doesn’t occur within 48 to 72 hours after starting the antibiotic, the clinician should consider antibiotic treatment a failure. Most studies have found no increase in complications, such as mastoiditis or cholesteatoma, when children were selected properly for observational management of AOM, as long as follow-up was ensured and rescue antibiotics were available for persistent or worsening symptoms. 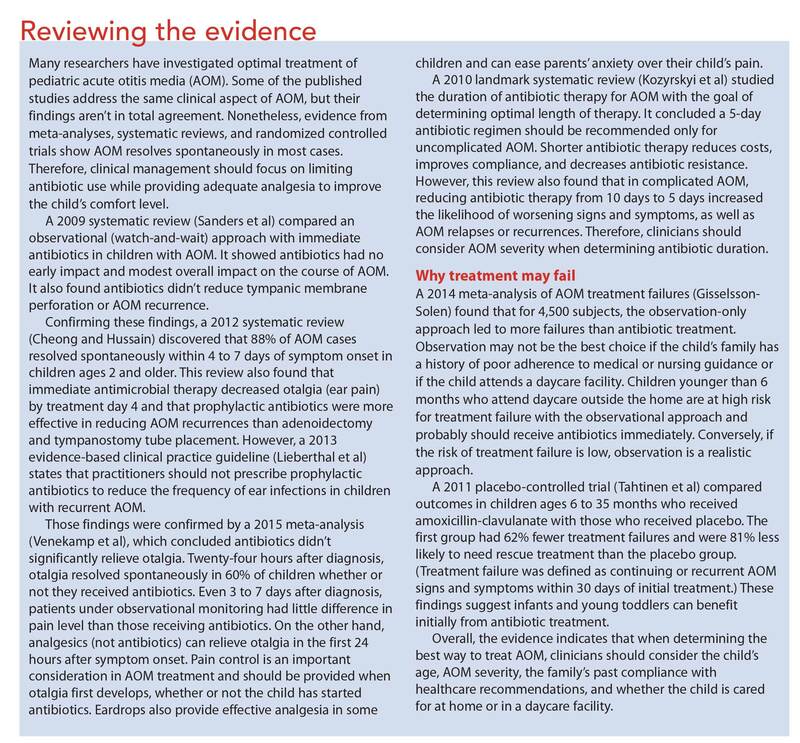 However, the decision to observe the child rather than prescribe immediate antibiotic therapy must be made jointly between clinicians and parents. Clinicians who choose observation must ensure adequate patient follow-up and instruct parents to contact them if symptoms worsen or don’t improve in the next 48 to 72 hours. Some clinicians give parents a written antibiotic prescription with specific instructions not to fill it unless the child’s symptoms get worse over the next 2 or 3 days. Others insist parents call them to request an antibiotic prescription. Providing adequate parent (or other home caregiver) education is essential. Teach parents that the child should show clinical improvement in 48 to 72 hours after starting antibiotics— for instance, a temperature decrease if the child has a fever, reduced irritability and fussiness, and resumption of normal eating and drinking patterns. If no improvement occurs within that time, advise them to call the primary care provider for evaluation for possible antibiotic resistance or a coexisting viral infection. Parental demands are a leading reason why some clinicians immediately prescribe antibiotics for children with AOM. Many parents (and even some healthcare providers) are misinformed about current practice guidelines and need to be educated on why antibiotics shouldn’t always be given initially. Some can’t accept that a condition that has always been treated with antibiotics may resolve on its own. Be sure to explain the nature of AOM, emphasizing that antibiotics aren’t always the best solution and shouldn’t always be given at initial symptom onset. Discuss current AOM treatment guidelines. Tell parents the condition usually is self-limiting and doesn’t require antibiotics. Emphasize that antibiotics aren’t harmless and frequently cause side effects. Reassure them that if their child’s symptoms persist, the clinician may prescribe antibiotics with careful follow-up and reassessment. • Eliminate exposure to secondhand tobacco smoke. • Avoid supine bottle feeding. • Eliminate pacifier use after age 6 months because it can cause backflow of nasal and pharyngeal secretions to the middle ear, promoting bacterial growth. • Breastfeed the child for at least the first 6 months, if possible. Bottlefed infants have reversed secretion flow into the middle ear, which can promote infection. • If possible, limit or avoid day care outside the home, which exposes children to many contagious illnesses. • Use analgesics for pain control, if recommended. • Keep the child adequately hydrated. • If the clinician has prescribed antibiotics, review possible adverse drug effects and tell parents when to report adverse effects to the primary provider. The well-child visit is an important opportunity to discuss how to prevent AOM and evaluate the child’s immunization schedule with parents. Strongly encourage an annual influenza vaccine for children older than 6 months as well as the pneumococcal conjugate vaccine, according to current immunization guidelines. Both vaccines drastically decrease AOM incidence and thus the possible need for antibiotics. Office visits for AOM have declined 40% since introduction of the pneumococcal conjugate vaccine. The influenza vaccine has a 30% to 55% efficacy rate in children who have AOM with coexisting upper respiratory illness. Sound clinical skills and judgment can play a role in the proper treatment of pediatric patients with AOM. In addition, studies indicate a team approach to treating AOM significantly reduces unnecessary antibiotic prescriptions. If you work in a healthcare provider group, advocate that the group adopt a practice guideline and reach a consensus to establish an antibiotic policy. The authors work in Columbus, Ohio. Katherine Young is a family nurse practitioner in the Stroke Prevention Clinic at Riverside Methodist Hospital. Jill F. Kilanowski is an associate dean in the graduate nursing program at Mount Carmel College of Nursing. Cheong KH, Hussain SM. Management of recurrent acute otitis media in children: systematic review of the effect of different interventions on otitis media recurrence, recurrence frequency, and total recurrence time. J Laryngol Otol. 2012;126(9):874-85. Coker TR, Chan LS, Newberry SJ, et al. Diagnosis, microbial epidemiology, and antibiotic treatment of acute otitis media in children: a systematic review. JAMA. 2010;304(19):2161-9. Gisselsson-Solen M. The importance of being specific—a meta-analysis evaluating the effect of antibiotics in acute otitis media. Int J Pediatr Otorhinolaryngol. 2014;78(8):1221-7. Kozyrskyj A, Klassen TP, Moffatt M, et al. Short-course antibiotics for acute otitis media. Cochrane Database Syst Rev. 2010;(9): CD001095. Lieberthal AS, Carroll AE, Chonmaitree T, et al. The diagnosis and management of acute otitis media. Pediatrics. 2013;131(3):e964-99. Rosenfeld RM, Shin JJ, Schwartz SR, et al.Clinical practice guideline: otitis media with effusion executive summary (update). Otolaryngol Head Neck Surg. 2016;154(2): 201-14. Sanders S, Glasziou PP, Del Mar C, Rovers M. Antibiotics for acute otitis media in children (review). Cochrane Database Syst Rev. 2009;2:1-43. Tähtinen PA, Laine MK, Huovinen P, et al. A placebo-controlled trial of antimicrobial treatment for acute otitis media. N Engl J Med. 2011;364(2):116-26. Venekamp RP, Sanders SL, Glasziou PP, et al. Antibiotics for acute otitis media in children. Cochrane Database Syst Rev. 2015; 23(6):CD000219.